You are here: Home / Brands I Endorse / Chocolate Baked Einkorn Doughnuts at Home Plus Homemade Sprinkles Too! Chocolate Baked Einkorn Doughnuts at Home Plus Homemade Sprinkles Too! Okay, so I have a little confession to make. I love doughnuts. Yes, I’ve made them the old fashioned way at home before, but let me tell you, they do take a bit of time to make and sometimes this mama needs something that she can make quickly or off to Dunkin’ it is. Just keeping it real 😉 Now that we’re in the midst of homeschool, the kids and I, often have to leave the house early for co-op, exploration days, or field trips so I’m always on the lookout for simple baked recipes that we can take to go. One of my specialties is making applesauce muffins since they’re a breeze to pull together in the morning; however, I’ve recently started noticing more and more doughnut recipes coming through my Pinterest feed. What’s made me dig deeper into these recipes is that they are not at all yeast doughnuts that need to be fried, but instead batter doughnuts that are baked in around 10-15 minutes. Now that was something I wanted to give a try! To make things even better, Craftsy offers a FREE downloadable Delicious Doughnut Recipes eGuide that got me started right away. I was excited to see some of my favorite bloggers sharing their best doughnut recipes in this free eGuide. Ashley McLaughlin from Edible Perspective, Ashley Rodriguez from Not Without Salt, Lyndsay Sung rom Coco Cake Land, and Jessie Oleson from CakeSpy. I’ve had the privilege of meeting Jessie a couple of times before. She’s such a fun person and her illustrations are butterflies and sunshine! The free Delicious Doughnut Recipes eGuide includes Jessie Olson’s recipe for traditional old fashioned donuts, a gluten free buttermilk baked donut recipe with a dairy free option by Ashley McLaughlin, and the one that I used, a chocolate baked doughnut recipe by Ashley Rodriguez. This recipe turned out perfectly moist just like what you would want from a good cake doughnut and won the seal of approval from all of my kiddos. I did make a few substitutions including using einkorn flour and sucanat as my natural sweetener. The original recipe is not heavily sweetened so it turned out gently sweetened, just the way I like it. All in all, it was a delightful recipe and since I used a mini doughnut pan, I was able to bake each batch in 6 minutes flat! 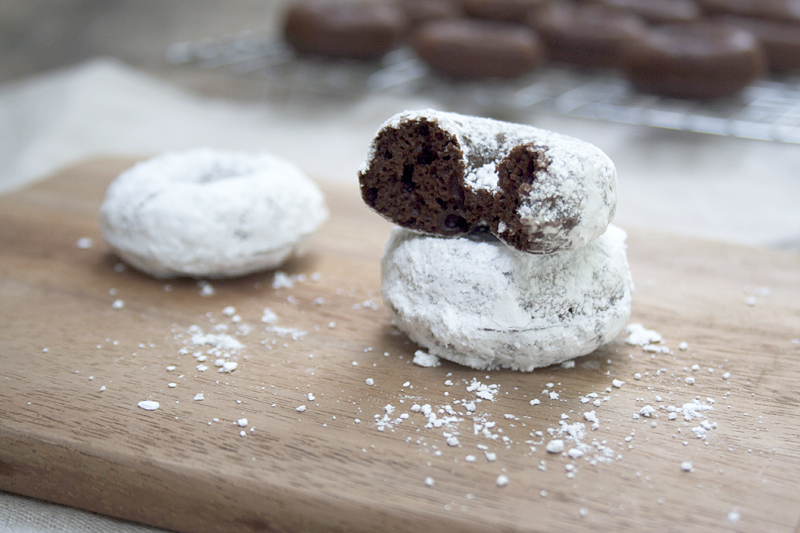 Chocolate baked einkorn doughnuts powdered with organic powdered sugar! Now one of the coolest things about the free Delicious Doughnut Recipes eGuide is that it also includes decorating ideas for glazes and making your own sprinkles. Did you know you can make your own sprinkles? I was so excited to learn that I could use this beautifully laid out tutorial to make my own sprinkles at home. With a couple substitutions, this coming holiday season is about to get fun! If you’d like to make your own baked doughnuts at home or homemade sprinkles, you can grab your own copy of Delicious Doughnut Recipes You Can Make at Home by Craftsy by clicking here. Also, I’d like to encourage you to check out the classes offered by Craftsy. What I love about these classes is that once you register for a class, it never expires. You can watch them over and over again and they’re always taught by expert teachers. Now, it’s time to get back to it and bake some pumpkin spiced doughnuts! Use all of the ingredients in Ashley Rodriguez's chocolate doughnuts recipe found in the Delicious Doughnut Recipes You Can Make at Home eGuide by Craftsy with the exception and addition noted below. Follow the instructions in Ashley Rodriguez's chocolate doughnut recipe, making the changes noted above. Also, I used a mini doughnut pan which only requires 6 minutes of baking time per batch. Have you made your own baked doughnuts at home before? Tell me, what kind of doughnuts are your favorite? 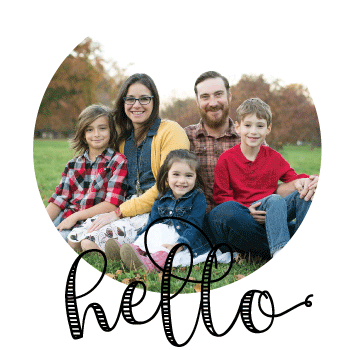 « Field Trips Made Simple and Healthy with Half Time + Giveaway! These look amazing! Any chance we could get the full recipe here? When clicking on A.R. site I have to enter my email before getting to the recipe. Mare, I got this one at Kohls, but I want to get a large, regular sized one. I think I’ll have to order it online. I love making homemade donuts. Our favorite is pumpkin with cinnamon sugar! When you substituted the einkorn was it a 1 for 1 substitution? Did you wait till the doughnuts were cool to powder? Thanks! Yes, Gabie. I waited until they were cool to powder. Also, yes, it was a 1 for 1 substitution. I got my USA (brand) donut pans (for regular sized donuts) at Kohls…during a 30% off sale and free shipping. I got 2 pans…and bake both at same time. Joyful baker has a confetti donut recipe…we leave out the confetti but have been trying her various donut recipes 🙂 and recommend those. two questions, please. . .did you ever post the recipe for the sprouted, sourdough applesauce donut? i would love to have that. is the einkorn flour the whole grain variety or the high extraction (sifted) type (or one of the others jovial now puts out)? I’ve never put the sourdough donut recipe up. I’ll have to make some soon and do that! As far as the einkorn flour, yes, it’s the high extraction from Jovial.